Evolve Grand Forks is a nonprofit organization with a mission to support a culture of entrepreneurship in the Greater Grand Forks community. This includes activities inside The 701 Coworking Space, and those outside of the space. We are community builders by trade through support and celebration of entrepreneurs as they follow their dreams. This annual report recaps a very successful 2017 and highlights some major plans going forward. We are excited to thank you for your support of Evolve Grand Forks and look forward to working with you more in the future. 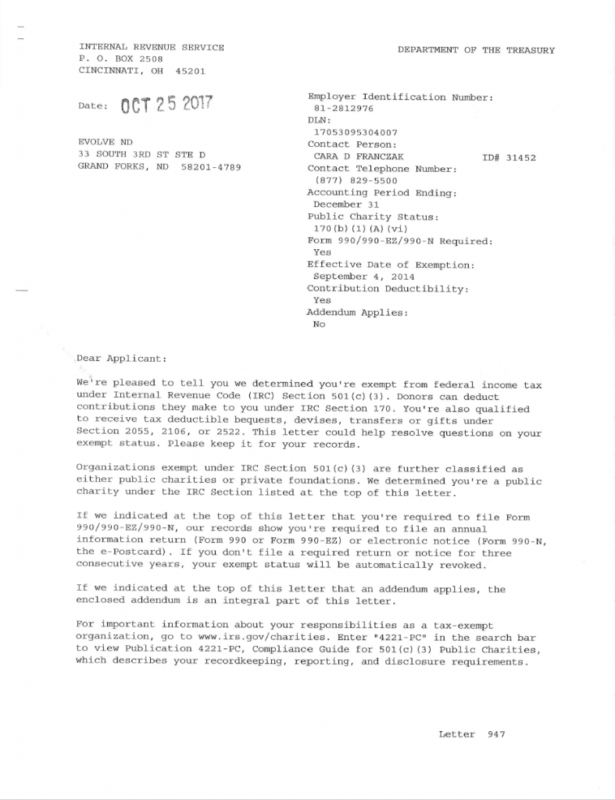 We’re now officially a 501c3 Exempt Non-Profit entity… and here’s the proof!